When creating your own color combination for Kumihimo, take a photo of the starting ”setup” so that you can reproduce it later. Attach your samples next to the photo print-out. …credit to Margaret Coe for the tip, I’m including her picture that she posted to demonstrate. In the basket study group one was observed using small bundles of sea grass and mentioned that when a large bundle is purchased the first thing that was done was to cut up the large roll into the typical length used. This was followed by comments: “Why didn’t I think of that!”. I used that tip recently and was happy with the results. If you are with a study group or with others and your hear a great idea that you want to use, write it down and drop it in the TIP JAR at the next OWG program or mail it to getrotter@comcast.net. It could be about weaving, who to travel with or maybe a great gardening tip. What are we learning? to open the OKFiberFest tour page.For detailed information on this package, click ->here. This link will redirect to the OKFiberFest web site. 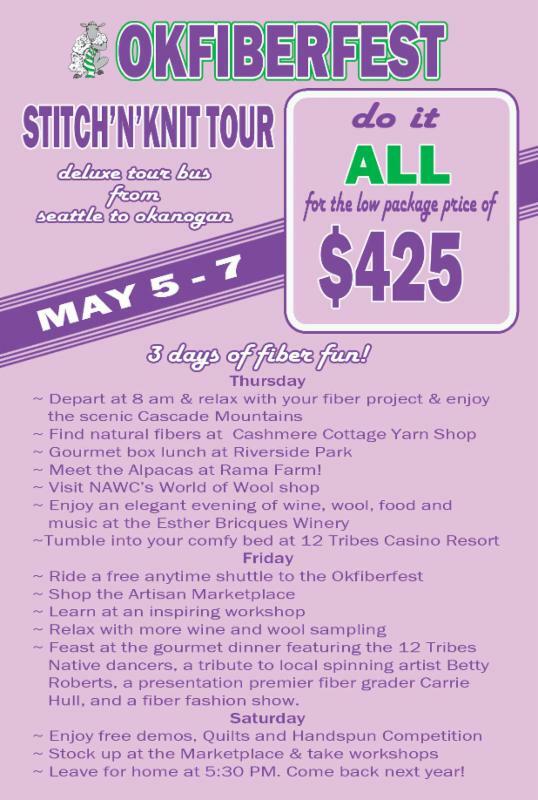 This link is provided for information only: OKFiberFest is not endorsed by or affiliated with Olympia Weavers Guild. The ethereal hanging installations of Amanda McCavour employ the material of thread as metaphor for memory and how we remember the spaces we call home. 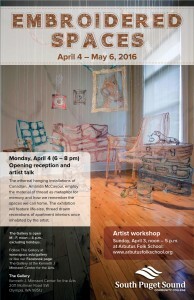 Artist Amanda McCavour will also be leading a workshop at Arbutus Folk School on Sunday, April 4th. 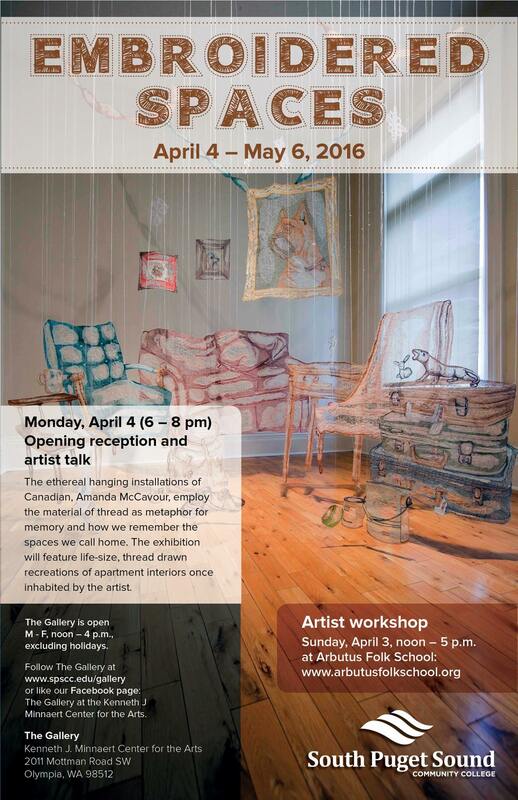 The guild offers to guild members a Beginning Weavers Course. One of our guild members teaches the course, which comprises 3 and one half days of class over a three week period. This leaves time for weaving between classes. The cost is $125. If one doesn’t have a table loom or any of the other small equipment items needed for the class, these can be rented from the guild. Classes are scheduled when we have 3 or 4 people interested in taking the class, which generally works out to 2 or 3 times a year. Participants will learn how to warp a loom, weave 2 projects and learn how to plan projects, selecting appropriate patterns and yarns. If interested in joining the guild and taking the course, please contact the guild website. 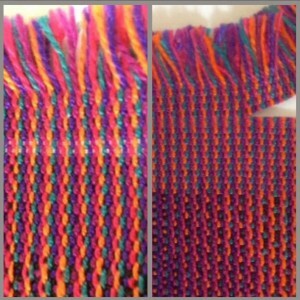 * When tying on a new warp to previous project warp, leave the old warp though the heddles and the reed. This will help the new warp from tangling while winding it on!! * Beat is very important in weaving. If your draft calls for a square pattern, you need to regulate your beat so that the packs per inch roughly equal the ends per inch so the pattern comes out square instead of rectangular. * To get some beautiful shades of gradual color change in your yarn, ply in a prescribed sequence. For example in a 3 ply blend Yellow, Blue and Red like: Y Y Y, Y Y B, Y B B, B B B, B B R etc.. A sequence can also be a warp or weft structure. * Tamie said she swore by weaving programs when designing for Sheep to Shawl. If you are interested in using computer programs talk with Carrie about what is happening in the Weaving Design Software Study Group. * Two person warping is a great practice and can catch errors early in the process. Invite a friend to help and have a warping party. Wine after warping is recommended. * Did you enjoy the oatmeal black walnut cookies in February? Someone did and the let the Tip Jar know. Beat shortening, sugars, eggs and vanilla until creamy. Add flour, salt and soda and mix thoroughly. Add oatmeal and nuts and mix. Form into rolls 1to 1-1/2 inches in diameter, about 12 inches long, and wrap in plastic wrap. Chill completely. Slice with sharp knife about 1/4 inch thick. Bake on non-greased cookie sheet at 350 degrees for about 10 minutes. Let cool slightly in pan, then remove to cooling rack. Note: I use more nuts than called for. This time I made 1/2 the recipe and used 1 cup black walnuts. It is the black walnuts, as opposed to regular walnuts or pecans, that give the cookies their particular flavor. Sometimes I break the big batch into several smaller ones and add different things to each part, such as chocolate chips, raisins or date pieces. I think you can do pretty much whatever sounds good.